How do I create a challenge for my fundraising campaign? Click the "You" in the top right corner and click "Admin Dashboard" for your organization. If you are an admin of more than one organization make sure you click the right one you want to work on. 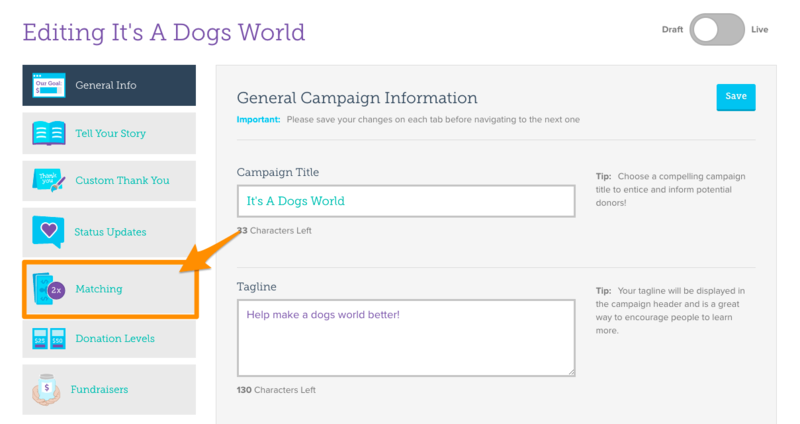 Select the Fundraising tab in the left navigator of your Admin Dashboard, then click the "Campaigns" section. Once in the Campaign section of your Admin Dashboard, select the Edit button beneath the campaign you'd like to edit, and you'll be directed to your Campaign Editor. From there, click the "Add Challenge" button to begin customizing your challenge opportunity. After clicking the "Add Challenge" button you will be taken to the form shown below where you can enter in the specific details of your challenge. If the sponsor of your challenge has a photo or logo that you/they would like to feature, you can upload that here to be displayed along with your match. This section is optional, but to add a photo, click "Select image" and then click "Apply" once you have adjusted it. If you click "Keep Sponsor Anonymous," this image will not show. This is the name of your sponsor. Enter in how your sponsor would like to be recognized for their sponsorship. 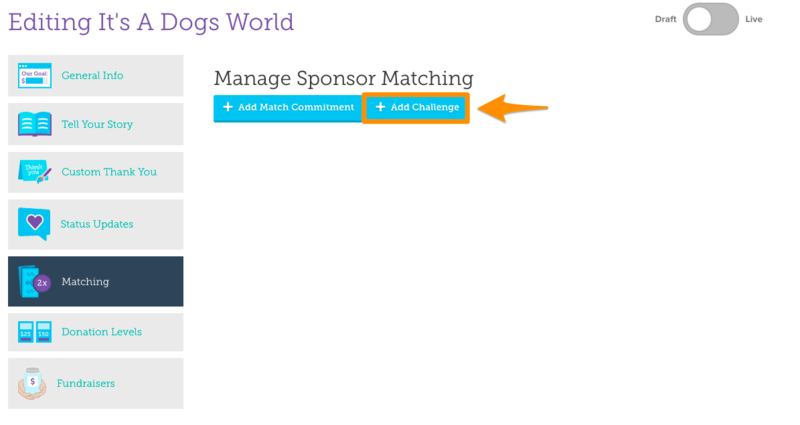 If you don't wish to highlight the sponsor publicly, you can check the "Keep Sponsor Anonymous" checkbox below. 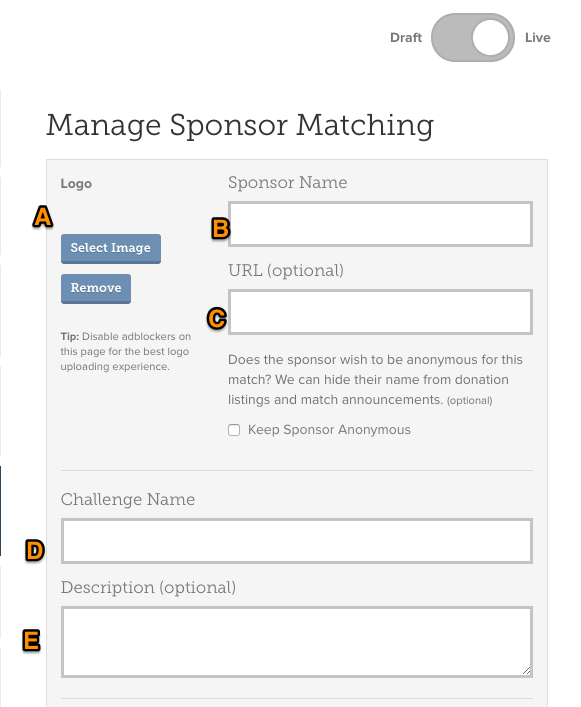 Here you'll want to add the name of your challenge as it will appear to donors. Think of this as the promotional name of your challenge - such as "Help Us Help More Pets!" or "Double The Dollars Challenge!" To give your supporters more detail about this specific challenge, you'll want to add a description. Here you can let your supporters know how their gift will be applied to the challenge, whether this is a "Dollar Challenge" or a "Donor Challenge," and any other info you want to include about this opportunity. Here you will choose which type of challenge you would like to set for your donors. You can either choose a "Dollar Challenge" which releases a bonus donation once a certain amount of money has been raised or a "Donor Challenge" which releases a bonus donation once a certain number of donors have made donations to the campaign. Here you'll want to set the amount of funds or donors that will help your organization reach its goal for this specific challenge. For example, if your goal is $3,000, you'll enter 3000. If your goal is 500 donors, you'll enter 500. You do not need '$' or commas. Here you'll want to enter the amount of funds that will be released to your organization once you have reached the challenge goal. For example, if your sponsor has agreed to donate $1,000 once you raise $3,000, enter 1000 here. 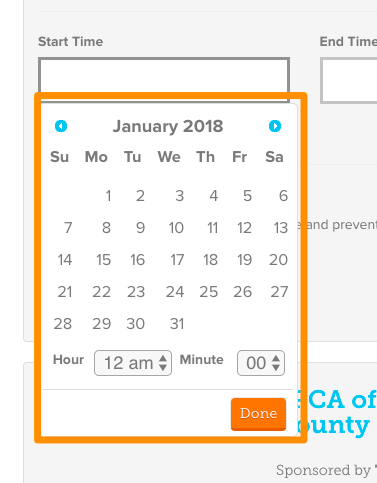 If your challenge has specific guidelines regarding when the donation must be made in order to qualify as part of the challenge, you can select the starting time of when the challenge begins by clicking the box under "Start Time" and selecting the date and time from the drop down menu. 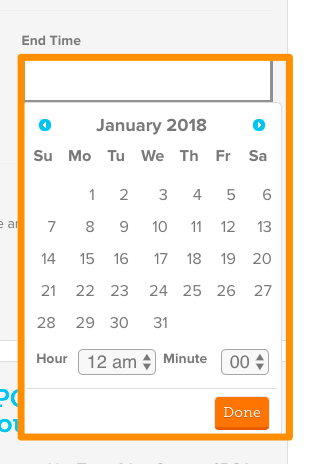 If there is a point where donations will no longer be counted towards the challenge, you can set the end date of the challenge by clicking the box under "End Time" and selecting the date and time you want the challenge to end from the drop-down menu. If this challenge is out of date or completed, you can "Archive" your challenge. This will stop the challenge from displaying on your fundraising campaign. However, this will not remove the donations from your campaign. Once you've completed this form, click "Save" to view your challenge. From this page you can view, edit, or remove this challenge from your Giving Day profile.